Taprite Dual CO2 Regulator - Texas Brewing Inc. 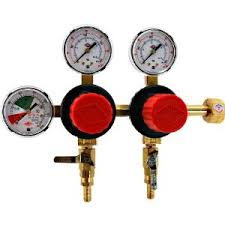 Tap two kegs at the same time and control the pressure to each. Taprite Regulators continue to meet the various demands of the beverage industry. Robust design delivers performance and reliability. Extremely durable and user friendly polycarbonate bonnets make adjustments a snap! Pull cap to adjust the pressure and push back to lock it in. Tapright Dual Reg Review by Paul C.